It’s a niche yet growing culture among upwardly mobile and primarily urban Indians. Leisure biking is riding a bike simply for the joy of it and not to get from point A to point B—a ride on a sunny weekend, a trip to the mountains or heading to the mecca of biking in India, Ladakh. Bike enthusiasts revel in the feeling of being one with their machines and letting the wind take over. It’s that kind of mood that I wanted to get into when I donned my Harley boots, grabbed my glares and decided to get some sun on my back with the newest babies from the Royal Enfield (RE) stable. No longer just the Bullet, the Classic also has RE’s most advanced engine family yet. The bike was introduced in India in two avatars, the 350cc and 500cc models, a couple of years ago. 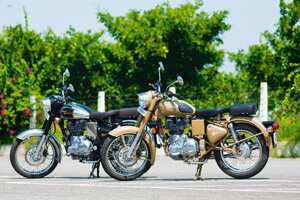 Now the company has launched two new variants in the Classic family. And both pack in a fair amount of attitude and oomph. The Classic Chrome is literally just that. The regular Classic but with better overall finish and lots of gleaming chrome fittings. The bike is mechanically identical to the erstwhile Classic 500, but it certainly looks very regal now. Before I could even think of riding it though, its new sibling caught my eye. The Desert Storm variant is simply what today’s generation of bikers would love. Having said that, the bike holds tremendous appeal even for the baby-boomer generation, since it draws on the retro appeal of bikes from the World War era. The Desert Storm is sand-coloured, and while it still uses the underpinnings of the modern Classic from RE, it looks like it belongs with a French legionnaire of the early 20th century. Before I get completely carried away with the romantic visuals of riding across the Sahara, let me quickly come back to reality and tell you what the ride felt like. I remember being pretty impressed with what a major leap the Classic was from the older RE bikes when it first arrived. The Desert Storm and Classic Chrome are every bit the same sorted and stable bikes, which offer ease of use, smooth gear shifts and reasonably quick acceleration. They both carry over the features like the self-start, and the simplistic instrument cluster. The bikes don’t feel heavy and clumsy, despite the cruiser stance. The optional rear seat means you can take someone else along for the ride. I have to say there was marked improvement due to the reworked suspension, especially up front. The bike also uses twin gas-charged shock absorbers, which give you a smoother ride. This is very much in line with the touring-bike philosophy of being able to glide over the road. The Classic is powered by a 499cc engine with 27.2 bhp power output. It was an enjoyable ride for the most part, though of course when it comes to sheer performance, those with the need for speed should consider sportier offerings. The Classic is every bit the leisure bike, meant to be enjoyed in the same way. It is not a very fast bike, which is why RE in fact is still far behind in image, in some of its export markets where bikers expect touring bikes to breach the 100 miles per hour barrier. Of course for those who have the money, and the will to go faster, there are several other tourers available in India now, primarily from the Harley-Davidson stable. But for those who want a less expensive yet fun weekend ride, and don’t want to get caught in the commuter biking market that stretches from about ₹ 40,000 to ₹ 1 lakh, or go down the sports-biking route, there is a Classic waiting to find its home in your garage. Siddharth Patankar is Editor, Auto, NDTV.